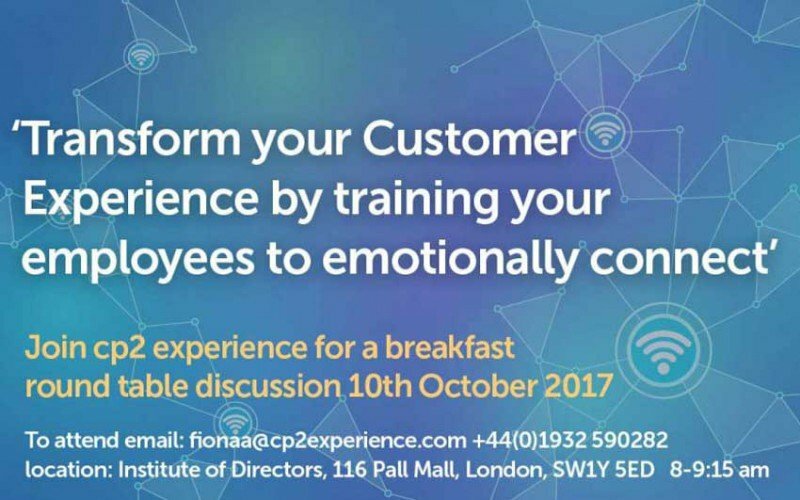 John Aves Chief Executive cp2 experience invites you to join our Breakfast Round Table Event on the 10th October 2017 to be held at the Institute of Directors, 116 Pall Mall, London SW1Y 5ED. 8am – 9.15 am, a light breakfast will be served. We will discuss how to …. ‘Transform your customer experience by training your employees to emotionally connect’. Our Guest Speaker is Mark Gould, a senior retail executive with experience of customer led leadership in a number of diverse retail and financial services organisations in the United Kingdom, United States and, for the last seventeen years, in Ireland. Prior to moving to Ireland in 2000 Mark worked for a number of UK retailers including John Menzies and Dixons as well as Barnes and Noble in the United States. Since moving to Ireland he has led the Hughes & Hughes bookseller chain and the O2 Ireland retail, online and telesales businesses. In recent years Mark has worked with a number of leading retailers to help improve their customer experience and commercial performance including Penneys/Primark and B&Q. As Head of Retail Transformation at Allied Irish Bank since 2015 Mark has been implementing a series of changes to improve the retail experience for customers and transform the business into a leading service provider. Mark will discuss how to align leaders and the critical role that behavioural change plays in a customer led transformation. John Aves is the Chief Executive of cp2 experience. The over-arching focus of John’s work over 25 years has been in the area of customer led growth. He is passionate about customer experience as a strategy to drive customer loyalty, employee pride and profitable growth. He believes that every successful customer strategy needs to focus first on the people within the organisation, without whom nothing will happen. To attend this free event and join in the discussion please email fionaa@cp2experience.com – giving your name and email address. We look forward to meeting you.